For the last couple of years I've been using a computer that's mission in life is to break my spirit. It took five minutes on average to load a website, outright refused to load google maps, and often stopped working right in the middle of a simple request for information about the weather. Trying to write a simple blog post took far too long, and on occasion I wasn't even able to add pictures because my snobby computer was too good for them! But no longer! I am liberated from its maniacal grip and am no longer subjugated to its evil whims. I now have a computer that fairly wags its tail when I ask for directions and leaps to obey my every command! I don't know that I'll post any more often because of it, but I will be a lot happier when I do. 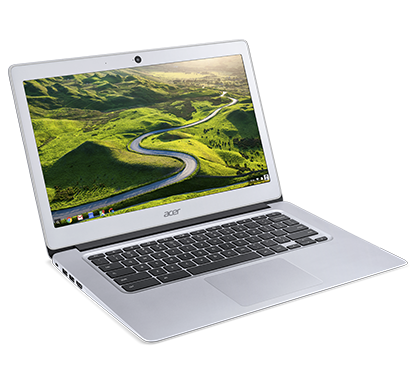 I'm pleased to introduce my new (and shiny) Acer Chromebook 14.
ps. this post only took 5 minutes to make! Yeah Molly! Your old computer frustrated me too when I visited. Congrats! Nothing is better than when electronic's work like they are supposed to! I'm in a Yellow State of Mind!